I have very strong and witty readers here at Mama's Cup, for whom I am quite grateful. I enjoy so much when you leave your comments and share your opinions and experiences. I also enjoy the email that I get from you, with tips or ideas or stories of your own. Several readers of Mama's Cup are Single Mamas who have shared small parts of their journeys with me. One recently lamented to me over the lack of decent, down-to-earth books for Single Mamas. Often the books that are available are formal, unrealistic or judgemental, choosing to moralize instead of aid. 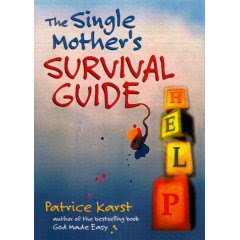 So I've searched out this Single Mother's Survival Guide by Patrice Karst. This book sound refreshingly honest, while maintaining a positive bent. As the Amazon review states: "On [Karst's] list of 'Reasons to Be Happy About Being a Single Mom,' the first one is 'because it's happening.'" Karst doesn't seem to sugar coat anything, but offers real "wisdom and inspiration for the single mother." I hope this is useful to you Single Mamas, the ones I know and the ones I don't. You deserve much respect. Beth, thank you for the heads up! The error was clearly due to my only being 1/2 a cup of coffee into my day. My apologies! I've relinked to Barnes & Noble where it is currently available. Thanks again so much for catching that!